SAGE is an international, leading publisher of groundbreaking textbooks, highly influential journals, and innovative, cutting-edge resources and tools in criminology and criminal justice. Known for our quality content, depth of coverage, and emphasis on connecting theory and research to real-life practice, we offer textbooks, journal content, reference books, and supplementary materials that represent the work of some of the most influential minds in the field. 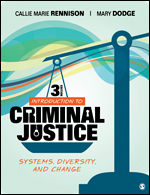 This newly revised Third Edition encourages students to think critically and discuss issues affecting today’s criminal justice system with engaging coverage of victims, criminal justice professionals, offenders, and controversial issues found in the criminal justice process. 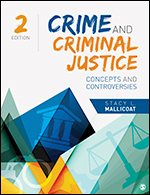 Updated with new content and current controversies that facilitate critical thinking, debate, and application of the concepts, Mallicoat’s Crime and Criminal Justice, Second Edition, provides accessible and concise coverage of all relevant aspects of the criminal justice system, as well as unique chapters on victims and criminal justice policy. Using an innovative format designed to increase student engagement and critical thinking, each chapter is followed by two Current Controversy debates that dive into a critical issue in criminal justice. These features challenge misconceptions by providing a balanced debate of both the pros and the cons of each issue and are followed by probing questions to help students think critically about timely topics. 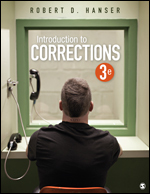 Introduction to Corrections provides students with a comprehensive foundation of corrections that is practitioner-driven and grounded in modern research and theoretical origins. This text uniquely illustrates how the day-to-day practitioner conducts business in the field of corrections in both institutional and community settings. Experienced correctional practitioner, scholar, and author Robert D. Hanser shows students how the corrections system actually works, from classification, to security, to treatment, to demonstrating how and why correctional practices are implemented. Furthering the reality of the modern correctional experience, the Third Edition includes a new chapter on immigration detention centers.